A kidney shaped pool is good for yards that don’t have defined geometric lines! A pool is a fantastic feature to add to your home’s backyard. They are a fun addition that the entire family can enjoy for countless spring and summer days. It can also serve as a fun way to exercise and can make for a beautiful source of décor in your yard’s landscape. However, to make a pool addition properly fit in your backyard’s landscape, there are some design aspects to take into consideration. For starters, you need to figure out what pool shape will fit into your backyard design. 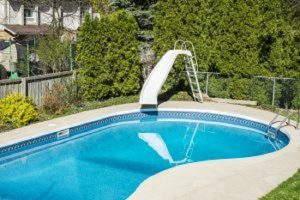 There is no universal definition for what the right pool shape is, so here are a few pool shape options for you to consider for your upcoming pool addition. The rectangular pool shape is a classic that a lot of people choose to go with. It is a popular choice to go with for a plethora of reasons. It is perfect for swimmers who want to use their pool for exercise, thus making their pool serve as a place for them to swim laps. It also works well in yards that have a geometric landscape. Pools that go with a pool shape without sharp corners are similar to a rectangular pool shape in their symmetry. The main difference comes from the fact that the ends are semi-circles with rounded corners. This type of pool shape is commonly referred to as a roman pool shape. Additionally, you can opt for a more kidney-shaped pool that works well with yards that do not have defined geometric lines due to the fact it does not have any corners or angles. Freeform pools have no rules on what pool shape they should be like. The design is completely up to you and the contractor you hire to help with your pool. This pool shape is ideal for natural landscapes and work well with various pool decoration you may desire to add, such as a waterfall. This entry was posted on Friday, March 30th, 2018 at 10:38 am. Both comments and pings are currently closed.